Recently, I have been getting back into biking / walking. I would like to do the Haul Ash coming up. It’s a 41 mile ride from Red Hook in Woodinville to Fremont and back. That would be the longest ride for me so far to date. But, I think that I can do it. 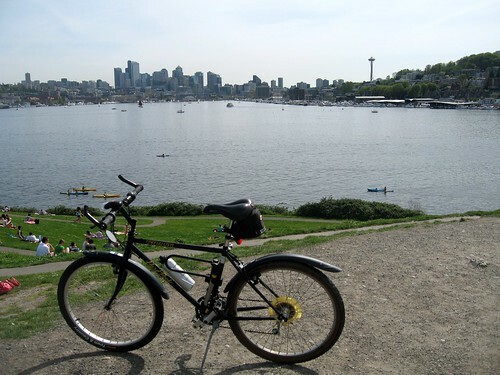 Just last weekend, I completed a 36 mi ride from Woodinville to Gas Works park in Seattle and back. It was a great day for it. By the end, I was at my limits. That is about as far as I could comfortably go. But I did get some great pictures out of it. You can see my favorite for instance on the left. This is taken at the top of the hill in Gas Works park facing south with the skyline in the background. The link above will take you to some other cool pictures of the city as well as Gas Works. I have been keeping the rest of my pictures from bike rides online here as well. I plan to add more there as I take them. 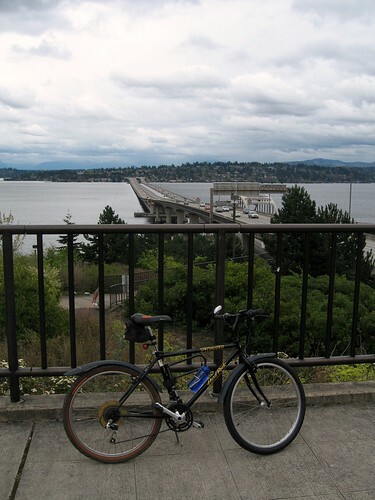 Some other fun rides I have done recently as well are a trip from downtown Issaquah along I90 up to the highlands plateau (challenging, but worth it) and back as well as a trip from Mercer Island across the I90 Floating bridge and into Seattle and back. A couple of select images from both of these trips are just below as well. Though, one somewhat exciting moment was that at the VERY beginning of my first ride this season (the highlands ride, pic to the right), I had a tire blow out while heading down the hill. Originally, I had parked at the top of the hill and was going to ride down and then back up. I only had made it about .75 mi (if that) when my front tire burst. However, at first, I didn’t know that is what happened. I just knew it was an explosive flat. Thankfully, I kept control (again, I was heading down a steep hill). I just slowly applied the breaks and stopped. I always carry spare tubes with me, so I moved off on to the grass and started to take the tire off so I could replace the tube. What I SHOULD have done is immediately matched where the hole in the tube was with the tire. Instead, I just scanned the inside of the tire for nails / glass / etc to see what I hit. I was confused since, I didn’t find anything, so I continued to replace the tube. Thankfully once more after getting the tube in and the tire back on, I again checked the tire to see if everything looked ok. It was then when I spotted what the problem was. There was a hole in the sidewall of the tire. I am not sure why, but when I had started to head down the hill, the pressure from me leaning forward must have caused it to give way. Darn. That meant I wasn’t riding any further than that. So I turned around and walked my bike back to the car (I was darn glad I wasn’t far away at that point). From there, I went to REI and found a new tire which was the exact make and model of what I already had (which is lucky considering it’s age). Then, I just reversed the ride and started from down off of Gilman where I was (because of REI) and biked UP to the plateau instead. It turned out to be a great ride. The shot of the lake (above-middle) is more amazing in person. Finally, one of the other interesting rides I have taken recently is a trip from Mercer Island to Seattle and back on the I90 bike path. (Some time I want to try this from Issaquah as well.) When I90 heads underground on the Seattle side, the bike path heads through a tunnel. It’s sort of neat to ride in the tunnel actually. It feels like you are going faster since the walls are closer. On the topic of outdoor pictures, I have also done some walks / hikes around recently as well. For instance I have also walked the same floating bridge path that I mention above. I didn’t go into Seattle, but did at least walk through the tunnel and back. I snapped the below picture of the skyline while it was still somewhat light out. In addition to the city, one day I managed to by chance find a cool natural area near my house which has a lot of different style of hikes to chose from. Originally, I was more just curious about checking out the first substation which the Snoqualmie Falls connect to. If you have some time (about an hour) I really enjoyed watching this video on the history of Snoqualmie falls and especially the history of the power plant there. Most people probably know of my interest in hydro electric power. I have been slowly making my way across the state visiting hydro-electric dams and taking pictures / understanding the history. Well, via satellite maps, I could see that the first Snoqualmie substation was near my house and I was curious to find it. Its somewhat eerie actually since it’s in the middle of nowhere. What is also strange is to find a manhole cover and fiber optic internet in the middle of the woods as well. As interesting as this is though, while the PSE substation which connects to Snoqualmie is so close to me, my power actually comes just about directly off of the BPA lines which run a few blocks from my house. I think my neighborhood is the only one around it seems which gets power from BPA lines rather than PSE. Other than the power part of it though, as you can see (to the right), there were some great hiking trails through the woods here as well. There was a LOT which I missed as well that I should catch some other time (since its so close). In other photo related news, recently, I got to participate in the launch of the new Photosynth.net. Many of you already know I like to take panoramic pictures. I have been using a microsoft research tool for the last 5 years or so to create these. They now released a new version to go with the new photosynth site which can also upload 3d panos directly to their site. This is awesome since I would go through a ton of hassle in the past to post mine (I won’t even bother linking since there are too many to link and they will look like crap compared to the new ones). I think that my favorite so far on the new site was one of the series of pictures which I took on top of Taipei 101 in Taiwan. (Which I continue to point out was the tallest building in the world at the time when I was there, which means I have been on top of 4 buildings now which have at one point been known as the tallest, and two of them (taipei / world trade center) at the time they held the title. I have also posted pictures from Boundary Dam as well as Chicago (Sears tower) on there as well. Finally, I have been playing around a little with displaying live / dynamic data on this site. In the beginning, this started with just showing the latest twitter post from the twitter account I manage for this site. You have probably noticed its been a long time since it’s changed. Sorry, I am working on that. Since then though, to the right, I now have my current list of Pandora (music) stations, as well as the list of most played artists on Last.Fm. (Note that I have a last.fm scrobbler for Pandora, so there is a good chance that the top artists are going to seem to fall into the Pandora stations I have listed.) I also have added a list of top Scientific / Technology news bits to the right as well. I follow WAY too many feeds to collate into one feed, but this seemed like a decent set of feeds I follow to show the top bits of news I am following. That list will always be up to date with the news. For all of these, I am using the power of Yahoo Pipes. I have a very long list of feeds I have created there which I follow. Everything from what all my friends post on facebook and twitter to deals on hard drives. I was then following these on My.live.com (the follow-up to start.com), but on April 20th 2010, the last my.live.com site was taken down and I no longer have a decent online RSS reader to use. My.msn.com is horrible. I am not really a fan of igoogle, or yahoo’s custom home page either. I have been testing out google reader for now, but it treats every item as email, which at thousands incoming a day, I can’t keep up. You will also notice I added like buttons to all the posts as well as to the home page (all the way on the bottom on the right). This is somewhat of an experiment to see how all of this integrates with facebook. Who knows if it will all stay, but so far its pretty interesting. Feedback on all of this is also welcome. You know how to get in touch. Ok, well that all (including the olympics post) took about 4 hours to gather & write, so I should sign off for now. Till next time.